We humans, including myself, were taught to maintain our gardens unnaturally by growing plants spaced apart, separated by wood mulch around each plant. If we want a environmentally friendly, natured based garden we must allow plants to spread and fill in all the bare areas of a garden as a living mulch. This is the way nature has been gardening for thousands of years! A living mulch will provide more wildlife habitat, improve the soil, infiltrate more run-off and suppress more weeds. This saves us time, labor, and money. I often hear some gardeners don’t use native plants because they spread too much. Yes, many native plants are spreaders, some spread more than others, and a few are “clumpers”, i.e. don’t spread at all or very much. Some native plants don’t look like they are growing above ground initially, because they’re focusing on making their root systems below ground, then they explode. Other native plants, called pioneer plants, spread and bloom profusely the first few years, then begin to die off or decrease in numbers, as other slower growing native plants emerge. Other plants, like woodland plants, spread profusely and bloom, then go dormant later in the season. So here are some basic guidelines I hope will encourage you to use native plants, both spreaders and clumpers, as a living mulch. Black Eyed Susan (Rudbeckia hirta) is a pioneer species. 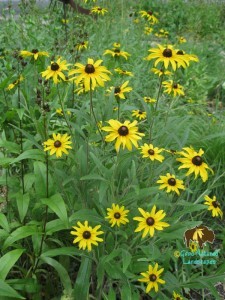 There are other native rudbeckias which are not pioneers, and some spread more than others, so choose the appropriate Rudbeckia for your garden. Some natives spread more than others. Learn which plants are aggressive spreaders and don’t use them in smaller gardens and use sparingly in larger gardens. Example: Cup Plant (Silphium perfoliatum). BTW: I teach a 1.5 hour class called “Favorite Native Plants through the Seasons” giving tips about spreaders. Remember, native plants are dynamic. They spread more when conditions are right, and when conditions are not, they take a back seat . For example, a native perennial which typically grows in moist conditions may go dormant during a drought, while a perennial which prefers dry conditions may thrive. Learn which plants go dormant naturally (ephemerals) or in extreme weather conditions. Add plants that emerge later or thrive in various conditions without going dormant, so there are less bare spots in your garden. When you visit a natural woodland, a bare spot doesn’t necessarily mean a plant is not there, it just may be dormant. Plant in layers. Include some spreaders of various degrees, and some clumpers, occupying all the space in your garden. Strategically add thrillers which are clumpers (plants which stand out and look good multiple seasons), fillers to occupy voids between clumpers, and crawlers along the ground (groundcovers or lower growing plants). Example: Golden Alexander (Zizia aurea) spreads and is a good filler, but it still allows clumpers and crawlers to grow. Learn which native plants grow together in the wild. These are called companion plants or plant associates. Plants provide competition for each other naturally, so if you plant companion plants, they will more likely balance eachother out. A sustainable garden is not only about growing plants that look well together but grow well together in the right conditions. Initially you may use wood mulch, leaf mulch or leaf compost to fill in the voids when planting live plants, my preference being composted leaf mulch. It’s also good to leave some bare areas of soil for ground nesting native bees. Eventually plants will fill in over time if designed well and no more mulch is needed except for naturally falling leaves and other naturally occurring organic matter, especially in a woodland garden. Birds, insects, the wind and other animals also disperse seeds into other areas of our garden and property so sometimes we have to do artful editing. But before removing a plant, remember the benefits of a living mulch versus a bare spot in the garden, and disturbing the soil. Invasive plants are different than spreading native or weeds, because they are so aggressive, choke out native vegetation , have no natural competition, and are very difficult and expensive to control. Some native plants like Tall (Solidago altissima) or Canadian Goldenrod (S. canadensis), spread very aggressively and should not be used or should be controlled in smaller native gardens. I believe when our prairie ecosystems where ecologically intact, these plants were not aggressive as they are today. Unfortunately we’ve change our ecosystems so much, a few native plants and other native species (example: deer population) have become “out of balance”, a term coined by Stephen Packard. I hope nature will inspire you to garden with a living mulch. If you still want to learn more, please visit and study natural areas, parks arboretums, yards where native plants successfully grow. 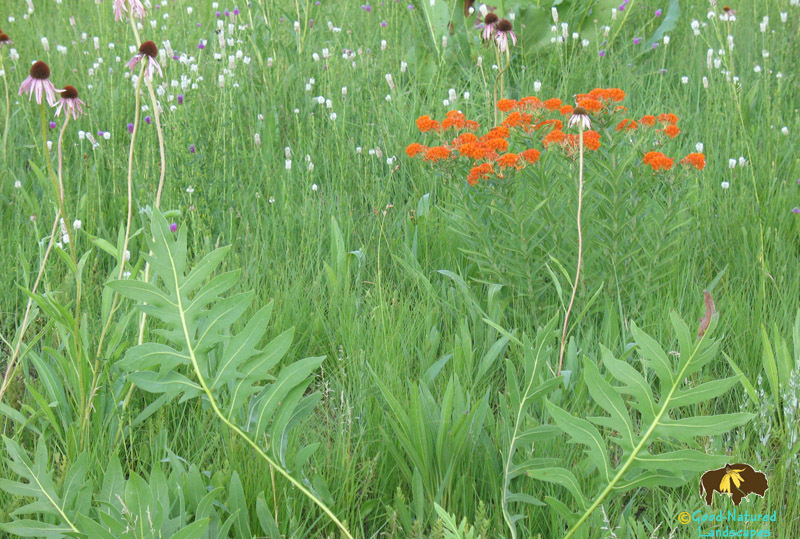 Also read our notebook article “Rethinking Native Plant Maintenance“. If you need a landscape plan to create a beautiful, ecological and environmental living mulch, please call Good-Natured Landscapes LLC. Thank you so much. I also enjoy your blog articles about the landscape design process.